When a shotgun shooter first starts to shoot the first thing that they must do is to find out whether their dominant eye is either their left or right eye. There is not only the right or left eye dominance, there are a lot of shooters who have central vision, which is neither the left eye or the right eye which is dominant. In my estimation, about 40-50% of all shooters have some problem with eye dominance, 48% of all babies are born left handed, by adulthood there are less than 15%. Therefore at least 33% of all shooters will probably have a master eye problem, to a greater or lesser degree. Eye dominance can change as well, due to, tiredness, ill health, age, damage to head or eyes, or even to the type of employment, sitting in front of a computer for long periods, this could account for up to 20% of right handed and right master eyed shooters having a master eye problem. Your master eye, for a lot of shooters, does not mean either left or right eye dominant, you could have central vision, left central or right central vision, all of these problems will more than likely affect your shooting accuracy. 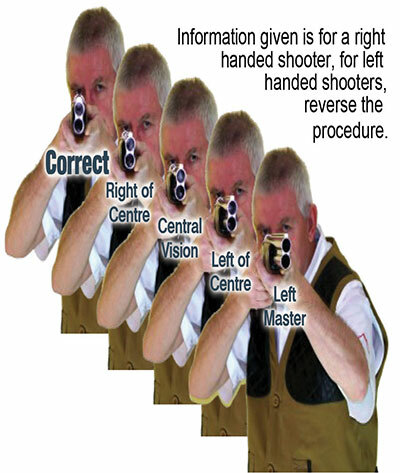 Test is shown for a right handed shooter, for left hand, reverse. 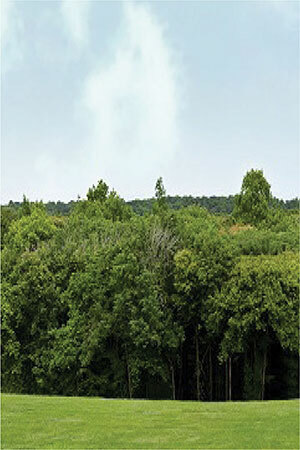 Focus on a precise distant object, for this example the lone tree in the centre is used. Clench your left hand into a fist and protrude your thumb to make a thumbs up sign, with your left arm straight by your side. Raise your straight arm quickly to point with your thumb at the object you selected. You should see two thumbs, one from your left eye and one from your right. Keep your arm straight and close your left eye, if the left of the two thumbs are blocking out the object, (see Fig 1) you have a right master eye. If the right of the two thumbs are blocking out the object, (see Fig 2) you have a left master eye. 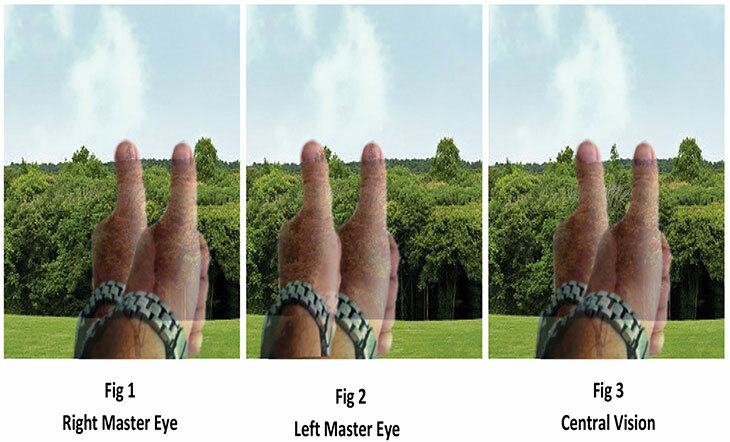 If you thumbs are either side of the object, (see Fig 3) you have central vision. In the past, if a shooter had a left eye dominance problem, the recommended cure was to close their left eye before shooting, the problem with this is that it takes over a second after closing the eye for the Visual Cortex to adapt to the new situation , making it more difficult for the shooting eye to lock onto the target. There is also the problem of changing from binocular vision, to monocular vision, the field of vision and peripheral vision is vastly reduced, the ability for the brain to calculate depth perception and the perception of speed are also greatly reduced. Humans have as we know, have two eyes with overlapping field that use parallax to give depth perception, to remove this ability by closing one eye, can only make shooting more difficult. With both eyes open the eye/brain is only capable of processing information at 16 frames per second, therefore, we are always seeing the target a little behind, due to our brain processing time, if one eye is closed just before shooting, this small delay, plus over a second further delay for the brain to adjust to monocular vision, means that we will be seeing the bird in the past, making it more likely that the shot will be behind the target. I thank Christian Schulte for contributing the technical information.